LORDSTOWN, Ohio – It wasn’t that long ago that Randi Weingarten and the American Federation of Teachers were part of a campaign to save a plant from closure after executives announced the company was “taking decisive action to curtail uncompetitive” manufacturing done there. The year was 2015. The company was Alcoa Corp. The city was Massena, N.Y. In a city of about 10,000 people, 487 jobs were to be eliminated when the state’s largest manufacturing employer announced it would idle one plant and close another after aluminum prices fell drastically. But workers, union leaders, state representatives both in Albany and Washington – including Senate Minority Leader Chuck Schumer – and the community rallied together and pushed the company to keep a plant open. The result: Alcoa signed a contract with New York to keep one of the plants open for 3 1/2 more years. It happened in upstate New York, Weingarten told the crowd at Lordstown High School Thursday night, and it can happen in northeastern Ohio. The key to such an effort, she told the audience of teachers, students, families, union members and elected officials, is collective action. Were the General Motors Lordstown Complex to be closed permanently, the effect would stretch well beyond the 1,500 workers there today, said United Auto Workers Local 1112 President David Green. And the teachers at area schools, whether at Lordstown or Austintown or any other district in the Valley, are part of that collective push that is the Drive It Home campaign. Lordstown Schools’ Alyssa Brookbank was among those from the Lordstown Teachers Association speaking in a show of support for the Drive it Home Campaign. 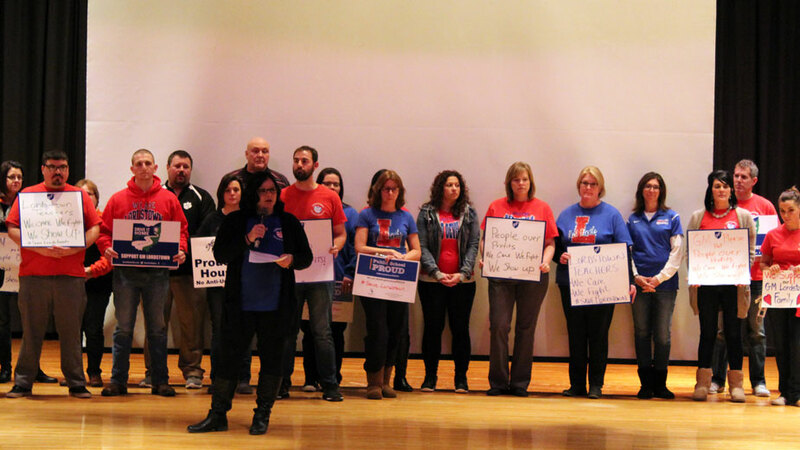 As part of the event, teachers from Lordstown Local School District talked about the impact the potential closure – GM has said it will cease production of the Chevrolet Cruze in March, but has not assigned another model to the Lordstown Complex – has had on them and their students. Jim and Mindy Moyer spoke about the impact GM’s decision has already had on those in Lordstown. Students in all grades are worried, other teachers and student speakers echoed. If their families aren’t working at the GM plant, then their friends’ families are. And with that is coming anxieties about who’s leaving and when, what the future holds at other schools in other states. It’s on everyone’s minds, they agreed. As a 19-year veteran of GM Lordstown, Moyer’s husband, Jim, pushed back against the idea that the automaker couldn’t succeed in the Mahoning Valley. The plant was ranked as GM’s best in North America by J.D. Power & Associates, he and Weingarten noted. For 50-plus years, the workers at Lordstown have brought that work ethic with them, Green and Weingarten said, and when that’s combined with the 2008 federal bailout, investment in the plant is owed. Lordstown Mayor Arno Hill at Thursday night’s event said he doesn’t expect much news out of Detroit until negotiations start between the automaker and UAW in September. Within the State House, Rep. Michael O’Brien, D-64 Warren, said there’s been work across the board to convince GM to assign new product to Lordstown. While other uses for the plant have been floated – Elon Musk said in a 60 Minutes interview that he’d consider purchasing the plant for Tesla and others have suggested putting in new manufacturing uses if GM does leave – Weingarten said those ought to put behind retrofitting the plant. 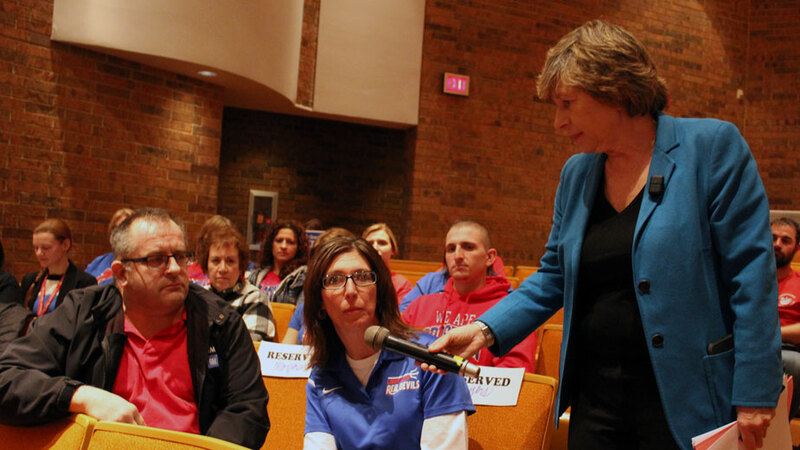 Pictured: Randi Weingarten, president of the American Federation of Teachers, led a town hall event for the Drive It Home campaign Thursday at Lordstown High School.